The thing about stories is that they’re different for each person. There’s the version the author delivers into the world, and then there’s the highly personalized experience for each individual reader. I’ve been thinking a lot about stories these last few months, since the Camp Fire in Paradise, Calif., destroyed my childhood home and those of 14,000 neighbors. In the perpetual hum of post-fire grief, it’s the shared memories of our town that have kept us resilient and connected. You gain perspective about the importance of stories when all that remains are narratives. That was my mindset when the assigned ToB novels were delivered to my door. I bent toward the novels like they were an escape hatch, and I was grateful for the opening to step through. It’s remarkable the comfort that can come from books, waiting for you to discover them. 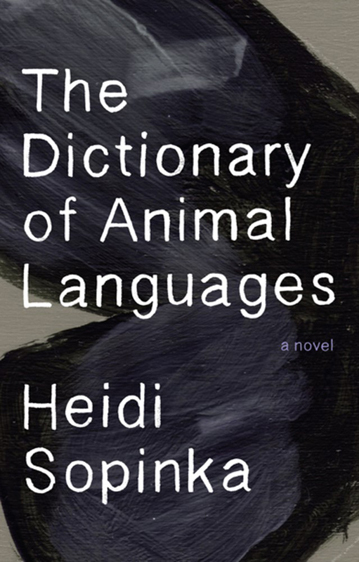 The Dictionary of Animal Languages by Heidi Sopinka is, despite its title, a bit hard to define. It’s about art, love, ambitions, and plans, but at its axis, it’s a tale about growing old, and what’s lost in the process of living toward death. This is an ambitious book. Any one of the many plotlines could have supported a single novel. The Dictionary of Animal Languages is a folio of curiosities that observes the natural world through art, music, love, and the inevitability of loss. Ivory Frame, the main character, is impressive and nuanced, as are the other people who inhabit her world. There were times when I had to mentally backspace and return to previous passages, to try and negate some confusion on plot lines and characters. The absence of dialogue quotation marks slowed me down more than once, but the extra work to keep things sorted out was rewarded by the book’s thoughtful writing. Sopinka isn’t just a terrific writer, she’s a great thinker. Her writing has particular sway and grace when she writes about the natural world. The passage detailing Ivory’s encounter with reindeer is especially breathtaking in its attentiveness. There is some mystery there that I honour. I think some people really do have a gift of seeing. And if they truly do, then most likely whatever they do will be transformative…The contemplation of the surfaces of things that stimulate vision. 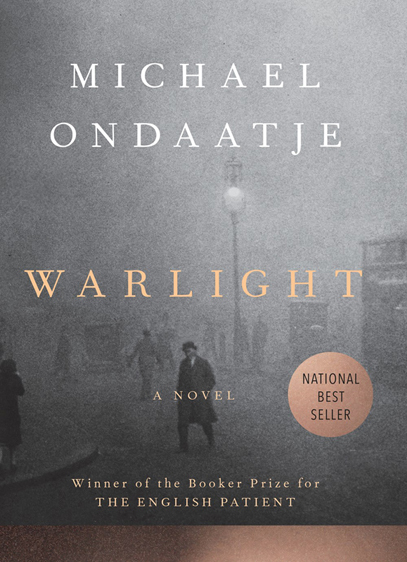 I started Michael Ondaatje’s Warlight on the kind of rainy day that makes you believe there’s nothing else to do but read. From the first page, I gave into the diaphanous mystery and captivating personalities. Ondaatje is adept at creating the vapor of characters, doled out in wafts that makes them seem like a well-crafted dream. Couple that with those atmospheric scenes that harken back to the Golden Age of radio shows—oh, the hushed anticipation—and Warlight has all of the qualities of a grown-up fairy tale. I didn’t need any more or any less, I found what was offered satiating. Warlight is the kind of story that makes you temporarily forget your own. What I found compelling in this book is that it doesn’t rush to tell you everything. There’s plenty of vacant space to allow for the contemplation of what transpires. I found the shifting point of view an effective device to move the reader around the characters more completely. We first come to know Rose Williams, a mother with wartime secrets, through her son, Nathaniel, but we come to really understand her later on, as we learn about her own childhood and her relationship with Marsh Felon and other mysterious characters in the book. Warlight needs no complicated plot twists to accomplish complexity; life is intricate enough, even when not everything is articulated. I also appreciated its use of fascinating tangents to enliven the story: like the concept of schwer, a musical notation to denote “difficulty” that serves as a child’s warning in the book, and Rose’s recounting of a famous chess match played at the opera. Everything in this novel connects without it seeming forced or contrived in any way. In the resulting self-portrait everything will rhyme, because everything has been reflected. If a gesture was flung away in the past, you now see it in the possession of another. So I believed something in my mother must rhyme in me. She in her small hall of mirrors and I in mine. The task of picking a book between two will always be subjective, and it’s done with all of the tones and shades of the person doing the picking. The magic of novels is how their story continues: how readers review and refine the storyline in their own words, how we share these books and our opinions about them, and how it all becomes a collective repository of thought. I could sincerely recommend both of these books to a fellow booklover, but I’m left to decide which one I’d offer first, if asked. In the end, it’s Warlight that resonated most clearly with me. I found the reading experience a welcome respite from my own dramatic tale. That’s my final judgement, but please, let me know your own story with these two books, and how it all ends. Pitchaya Sudbanthad: First off, I’m very sorry to hear about what happened to Judge Heron-Clark’s childhood home and the home of so many others in California. I believe what she says about the importance of stories to be true; they are what survives and a means for survival. It’s something I know to also be true for immigrants, refugees, and others upheaved from what was home. Stories, familiar or new, can be like rescue rafts for those adrift. What’s your initial impression of this judgment, Jessica Francis Kane? Pitchaya Sudbanthad is the author of Bangkok Wakes to Rain, published by Riverhead (US) and Sceptre (UK). Jessica Francis Kane: I like the way Heron-Clark highlights a few sentences from each of the books in order to capture their essence. In the same spirit, I’d like to point out that her own description of the power of story is terrific: “In the perpetual hum of post-fire grief, it’s the shared memories of our town that have kept us resilient and connected.” The idea of a perpetual hum attending grief of any kind makes devastating sense. 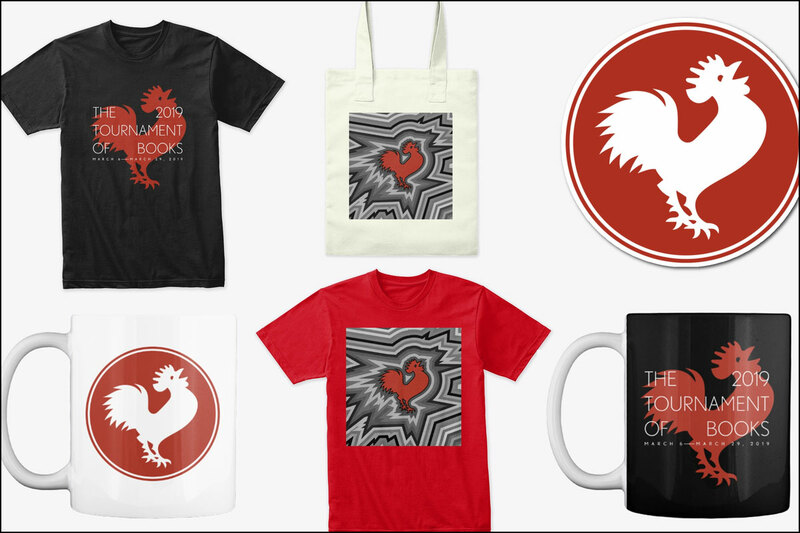 Reading through this hum, looking for solace and distraction in these books, should earn Judge Heron-Clark the first-ever Rooster Feather award (I just made it up) for compassionate reading. Pitchaya: I appreciate that Judge Heron-Clark took the time to read and re-read (and re-read!) a narrative like The Dictionary of Animal Languages. 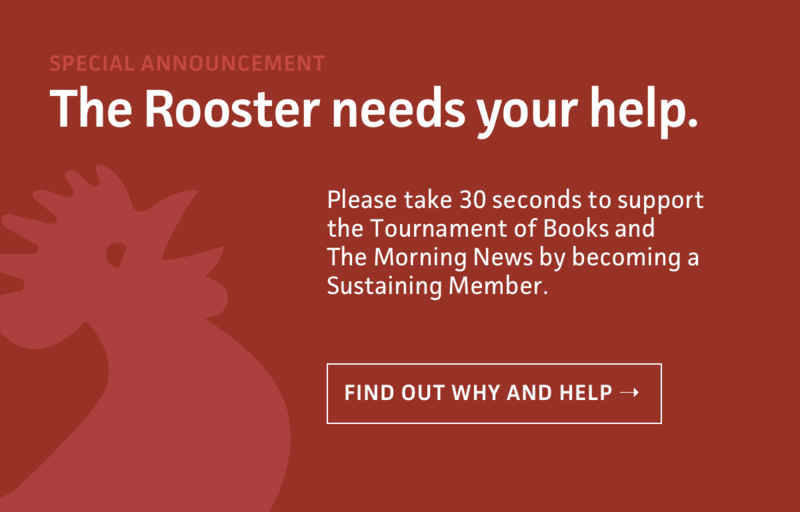 The attentiveness of the reader is all that a writer can ask for. When you come across a work that’s told in ways that you perhaps find hard to follow, what makes you keep reading and what makes you set a book aside, Jessica Francis Kane? Is curiosity alone enough? Jessica: I will stick with most books if the prose is fluid. Complicated form and structure are not a problem as long as on the sentence level I feel I’m on solid ground. So, to be honest, I have not read the books in this match, and the example of The Dictionary of Animal Languages that Judge Heron-Clark quotes above left me feeling a little...worried. It still doesn’t read right to me. Judge Heron-Clark admits to having to “mentally backspace” and re-read in order to get her bearings in the novel. I’m pretty confident I would not have been so resilient. I’ll give a book maybe two or three mental backspaces before I’m likely to put it down. Pitchaya: I’ve long been an admirer of Ondaatje. I remember reading his books when I was in my early twenties and trying to pull off what he did with poetic, sometimes counterintuitive use of language; I only ended up confusing people. But back to this decision, I like Judge Heron-Clark’s evocation of a folio of curiosities; I think it’s applicable to both books. Meandering and diversions are so pleasurable to me in their course. These two books don’t appear to employ efficient narrative propulsion, but instead, manifest like a “well-crafted dream” and proceed without a “rush.” I used to envy writers who could craft something that moves with such a willful drive that I couldn’t help but be pulled in by its wake to finish the book in a day or less. I’ve since noticed that I remember only the titles of books like these; I can’t recall much else. The books that allow you to settle and look around, that take you to places within places: Those are the books that stay, for me. Jessica: I want examples, Pitchaya. I’m not willing to say these two kinds of books are mutually exclusive. If a writer is fully in control of the voice and material, then a tangent doesn’t necessarily feel inefficient. As Judge Heron-Clark says of Warlight, “Everything in this novel connects without it seeming forced or contrived in any way.” I love a good, literary, propulsive plot. Hannah Tinti’s The Good Thief immediately comes to mind. But I also couldn’t read Helen Macdonald’s H Is for Hawk fast enough, and that book meanders a lot. Pitchaya: I’m thinking of books like Olga Tokarczuk’s Flights or most of W.G. Sebald’s oeuvre. They could arguably be page-turners for some readers, but I think that would be a tragic pace of reading, like sprinting through a museum. As a whole, there’s nothing wrong with propulsive plots. Like you, I very much enjoy reading books that have them. Perhaps it’s the faultiness of my own memory, but I remember more of the books where the form or language forces me to slow down. My brain can only hold so much of what it has binged. When I’m slowed, I hunch my back and inspect, drawing out the glasses of my mind to read more closely. I’m not naturally prone to close reading; perhaps that’s why I appreciate books that bring about the occasions for it. Can you write a labyrinthian book for me at some point, Jessica Francis Kane? I would love to read it. Put on exhibit the strange birds of prey and haunting family histories and unearthed artifacts. Confine your pages in huts stretched across the desert, so that one has to take a long, contemplative camel-back ride between each. Pitchaya: As an Ondaatje fanboy, I think I would’ve chosen Warlight as well. Kevin Guilfoile: All right, I’m back for just a second to salute The Dictionary of Animal Languages. It has vanquished some formidable competition and has had a good run through the tourney, but that run is going to end here. If the Zombie Round were held today, My Sister, the Serial Killer and There There would still be our mostly dead matadors. John and I are back again tomorrow to discuss the results when The House of Broken Angels meets The Mars Room. That’s one I’ve been looking forward to, for sure, and it’s the last chance for one of those books to slip into the Zombie Round.